How Do I Add, Invite, or Delete Students? How Do I Merge Students Into My Class? There are several different ways to add students in your class. If you want to invite them directly into your class, start at Invite Students to Join. If you only want to add gradebook students now (these are students that will not be logging into Kiddom accounts) you can start at Adding Students. 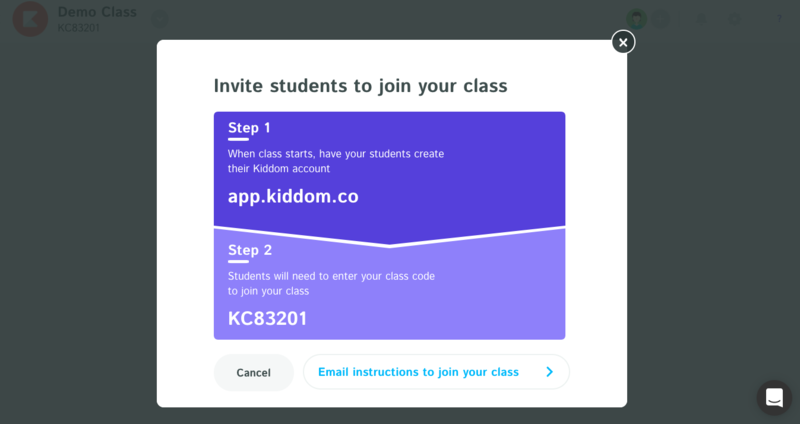 Invite students to join your class using your unique class code. Provide students with your class code, and have them join your class. If they haven't signed up for Kiddom yet, they can sign up here. You can also send your students a mass email with the class code. Just copy paste their emails and we will send them a link that already has the class code. Set Up Class Roster allows you to copy and paste a list of students directly into your class or you can import a roster from one of your other classes. Manually, you can type each student's name into the box. Hitting enter or the tab key will automatically add the student to your list. If a student joins your class using a class code after you had added them to your class list, this student may now have duplicate profiles. You can easily merge these profiles into one. To merge student profiles, go to your class settings. From there, click on the "students" tab at the top, then click "manage students." Check the boxes for the two student profiles you wish to merge. A blue bar at the bottom of the screen will appear, giving you the option to merge. It’s sad to see students go, but if you need to delete them from your class, you can do this in Settings. From "Manage Students" in your settings, find the student you’d like to remove. Click the checkbox to select them, and an option to delete them will appear at the bottom of the screen.